Tropical Resort Living Reimagined! 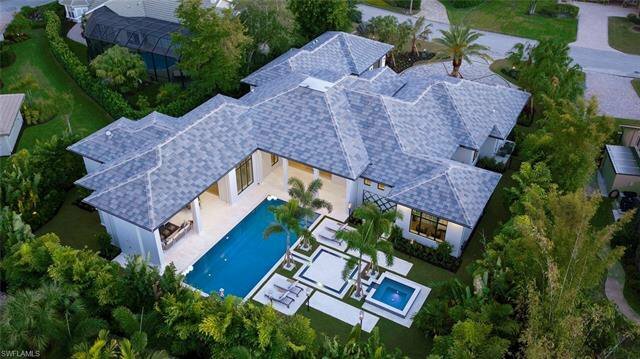 Stunning 2019 Rustic Contemporary Estate in the heart of Pelican Bay lives like a private resort. Extraordinary curb appeal with architecturally inspired stone and wood exterior perfectly complimented by lush mature tropical landscaping. A contemporary yet casual coastal interior vibe flows throughout. Floor to ceiling windows, gorgeous custom cabinetry, chic designer furnishings... AND THAT POOL!! Two spacious outdoor living areas overlook a 50’ resort style pool, 8’ infinity spa, and gaslight tiki torches that light at the touch of a button… all nestled in a completely private backyard. This is a true resort style home, featuring the most amazing outdoor living space of the season. Over 4,600 sf under air, 4 en-suite bedrooms, 3 living areas, a Chef’s kitchen with top-of-the-line appliances, and much more. Situated on a 1/2 acre just moments from Waterside, Artis-Naples, Mercato, and a short walk to the beach. Pelican Bay offers 3 miles of sandy beach, 2 gulf front beach clubs with dining and beach service; competitive tennis and the brand-new Club Pelican Bay featuring 3 award winning restaurants, 27 holes of golf, fitness center and spa. Listing courtesy of Calusa Bay Properties LLC. Selling Office: Premier Sotheby's International Realty.